I totally learned how to spin! Last November, way back before I embarked on my impromptu NaSelfProMo, I went to a workshop at the Dublin Knitting and Stitching Show and – finally! finally! – learned how to spin. That’s about seven and a half metres of 100% tussah silk, spun with a top-whorl drop spindle (see me with all my fancy terminology? ), and I am dead proud of it. The workshop was taught by a lovely North American woman, Ruth MacGregor of Spinning Forth, and the whole experience was a heady combination of electrifying and serene. From what I gather, after a handful of hours’ experience, the spinning goes much better if you’re relaxed. This can only be a good thing for wound-up, whirly-brained me. I have more unspun top from the workshop, in colours that would undoubtedly pop against the purple if I put them together (though admittedly this might also cause a rather more squelchy popping effect in the viewer’s eyes), and I … well, I may have had a leeetle credit-card accident in the Oliver Twist stall at the show. It was all so beautiful. I was wandering around after the workshop, in the slightly fevered daze that attends the last half-hour of the show, and as I passed the stall of Mr X Stitch, its doyen, Jamie Chalmers, called out a greeting and asked if I had any highlights from the day. I’d never met Jamie before, but such was his personability that I stopped to chat. “I’ve just learned how to spin!” I squeed, and Jamie and his colleague – who I believe may have been Bridget Franckowiak, aka BeeFranck – offered their congratulations. “Learning to spin is one of the most political things you can do, really,” said Jamie. “My sheep and I are going off the grid!” declaimed Bee (if it was she), with a grand gesture of the arm. We agreed that spinning was pretty damn political: a radical revival of a skill that’s been all but wiped from our culture. A statement about autonomy, about individual engagement with the material world. I told them about Women’s Work: The First 20,000 Years – because I rarely miss a chance to enthuse about that book – and we chatted for a while about textile politics, gender politics, and the contemporary craft revival. It was a lovely, serendipitous moment. And yes, the acquisition of this new skill feels political, feels important. It’s odd, maybe, but when I started String Revolution I had no notion of learning to spin. I identified as a knitter, an embroiderer, a crocheter, an aspiring quilter. I saw myself as string user, not a string maker. It’s only as I’ve become more immersed in the history and politics of textiles that I’ve developed this drive to understand the whole process by which we put simple fibres to the complex, varied, culturally nuanced, multi-faceted matrix of uses that we experience every day. It wasn’t until I read Should Everyone Spin? (and my brain went woomph!) that I was truly seized with the intention to learn. And now I’ve taken the first step. Wonky and exiguous though it be, this little skein is significant. Do you know how to spin? Would you like to? Comment and tell me your thoughts! If you haven’t yet, do join the Revolutionary Horde (aka the String Revolution mailing list). You’ll get the inside track on everything that’s going on at String Revolution, plus discounts, exclusive goodies, and whatever else I dream up to delight you. I need hardly add that you can unsubscribe at any time, and I’ll never do anything untoward with your contact details. Is it boring or relaxing to do, or both? I like the idea of being able to do everything from sheep to finished item, but I keep telling myself I will not take up spinning, as I can see another big stash building up, and not getting through it. And even if I do spin most of it, then there’s more yarn stash! I’ve been thinking I’d like to learn to spin for thirty years. 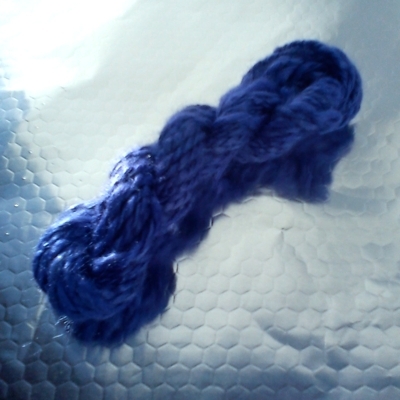 However, since I rarely even do anything with spun stuff I suspect I may be a bit overambitious. I’d like to spin nettles: the idea appeals to me. I asked for and got Women’s Work for Christmas, by the way: very interesting. Oh yes, the idea of spinning nettles, or other plants I can grow appeals to me too. I did a brief google for flax, but it seems it takes a lot of smelly prep before it can be spun. You could always spin and then give it as presents to knitters. Yay! I’m so glad that I could play a modest role in the chain of events that turned you into a spinner! I knew I *had* to point you to that post by Abby, it was so totally your kind of thing. I’m looking forward to seeing more from the string maker that you now are. Is it any surprise that my mother taught me to spin wool when I was a kid? 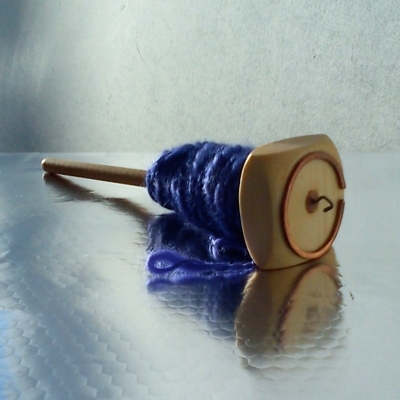 I was never very good at it (at 6 I don’t think I had the patience to spin thin and even yarn), but I learned it, both on a drop spindle and a spinning wheel. It could be interesting to see if I can remember how to do it. I suspect it might be one of those things that your hands remember if they’ve once learned it. I’d like to learn to spin; I suspect that, like sewing and knitting and weaving, it’s something I would like to know how to do but not actually do much until I felt I needed the results. I spin! I love to spin. There’s a group every month that meets in Powerscourt *just to spin* and it’s lovely to have the focus. You should read up on the old Homespun Society that used to be active in around the 1970s.